• This report identifies the global UAS traffic management system market for different stakeholders and regions. • The study also presents a detailed examination of the UTM systems market along with the market drivers, restraints, growth opportunities, and challenges. • The study provides details of various technologies enabling the UTM system. • The report also provides segmentation of various systems of UTM, and product mapping with key companies. • A detailed competitive analysis, which focuses on the key market developments and strategies followed by the key players in the market, has been included in this report. • The study provides a detailed view of funding scenario and regulatory framework of UTM systems. • The study provides a detailed overview of business opportunities for various key stakeholders in the UAS traffic management systems market. • The UAS traffic management systems market has been analyzed for all the regions, namely North America, Europe, Asia-Pacific, and Rest-of-the-World with further analysis of the key developments with respect to several major countries. 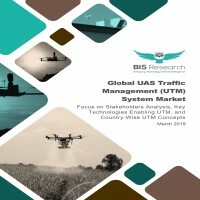 • The study provides detailed analysis of various key players in the UAS traffic management system market namely AirMap, Airware, Altitude Angel, Analytical Graphic, Inc., DeDrone, DJI Innovations, SRC Inc., Kittyhawk, PrecisionHawk, SenseFly, Skyward, Unifly, AiRXOS, Aeronyde Corporation, Amazon, X (Project Wing) in the company profiles section. This section covers business financials, company snapshots, key products and services, major developments, future programs (if any), and the individual SWOT analysis. Flight technology has changed the contours around the domain of aviation. Aviation is one of the most key innovations that has brought forth various kinds of modern technologies – from propulsion systems to artificial intelligence and modern communications – which have opened numerous windows of opportunities. The first unmanned aerial vehicle (UAV), which was primarily used for military application, was developed in third decade of the 20th century. Since then, UAVs have evolved to a large extent in the technological sphere. In the past decade, UAVs have undergone significant developments such as considerable reduction in weight, size, and cost, enhanced battery life, and increased degree of autonomy in its operation. Unmanned aerial vehicle (UAV) can be defined as an aircraft system that can be controlled using a remote or an on-board computer system. UAVs are a part of unmanned aerial system (UAS) that include a UAV, a controller on ground, and a communication system between UAV and controller. UAVs have emerged as a powerful tool for various military and non-military applications. UAVs have emerged as a cost-effective solution for a wide range of commercial applications, such as precision agriculture, surveying, aerial photography, and mapping, among others. As the use of unmanned drones are rapidly on a rise, it is evident that there is an impending need for management services to control and manage these drones. The management concept for these drones was devised by NASA in 2013 for the safe integration of drones into the airspace. Since 2016, NASA has been leading most of the research and development initiatives in the UAS traffic management (UTM) arena and has been involved in testing its UTM platform with various industry partners under its testing capability level (TCL) program. The UTM system is an upcoming phenomenon that is envisioned to skillfully manage drone traffic in the lower level of the airspace. There are different technological paths which are enabling the UTM system to expand its network coverage for wide range of operations. Detect and Avoid systems, vehicle-to-vehicle communications, drone tracking, and remote identification are some of these technologies. Besides, technologies such as cell/wireless, Automatic Dependent Surveillance-Broadcast (ADS-B), satellite Ku band, beacon-based systems, and others can be used for communication and present a wide opportunity for communication service providers to communicate with the other aerial entities in the UTM market. The whole system is expected to be designed in a digital framework. Drones and other aerial vehicles are going to generate significant amount of data such as flight route, trajectory of drones, mission information, etc. This data can be of use to get valuable insights and to further help optimize travelling and mission planning. As drone applications are becoming widespread, there is a need for service delivery model in the unmanned traffic management ecosystem, can manage the fleet of drone in the low altitude airspace. As the fleet of drones in the airspace increases, there is bound to be huge amount of data that a drone can acquire through surveillance and inspections. Such a resilient information flow between drones and flight management provider requires a solid infrastructure for transferring billions of data packages. The UAS traffic management system market is segmented on the basis of region into North America, Europe, Asia-Pacific, and Rest-of-the-World. Each region is developing its own concept of operations to develop UTM systems for safe integration of drones into the airspace. Some of the key companies in the UAS traffic management system market include AirMap, Unifly, and Skyward, Airware, Altitude Angel, Analytical Graphics, Inc., AiRXOS, DJI Innovation, SRC Inc., Kittyhawk, Aeronyde Corporation, X (Project Wing), Amazon Prime Air, PrecisionHawk, and SenseFly.